Myth, history, and magnificence – the Hanging Gardens of Babylon tread the fine line between all these avenues to emerge as one of Herodotus’ Seven Wonders of the Ancient World. And while the name itself evokes a reverie of a colossal construction with lush greenery complemented by the kaleidoscopic bevy of flowers and herbs, unfortunately, there is very little archaeological evidence to support the presumed massive scale of these ‘hanging’ gardens from ancient Mesopotamia. In any case, the folks over at Lumion 3D have given a go at virtually reconstructing this nigh mythical monument from antiquity – and the results are quite breathtaking, to say the least (albeit with a few artistic licenses). Furthermore, the walls, which had been constructed at great expense, were twenty-two feet thick, while the passageway between each two walls was ten feet wide. The roof above these beams had first a layer of reeds laid in great quantities of bitumen, over this two courses of baked brick bonded by cement, and as a third layer of covering of lead, to the end that the moisture from the soil might not penetrate beneath. On all this again earth had been piled to a depth sufficient for the roots of the largest trees; and the ground, when leveled off, was thickly planted with trees of every kind that, by their great size or other charm, could give pleasure to the beholder. And since the galleries, each projecting beyond another, all received the light, they contained many royal lodgings of every description; and there was one gallery which contained openings leading from the topmost surface and machines for supplying the gardens with water, the machines raising the water in great abundance from the river, although no one outside could see it being done. Now this park, as I have said, was a later construction. However, as we mentioned before, beyond ancient descriptions, there is very little actual physical evidence to support the notion of a giant structural garden by the banks of river Euphrates. And we take the route of conjecture, the wonder was possibly built (if it was built at all) to replicate a mountain with an array of terraced gardens. And as we can comprehend from Siculus’ description – the structure possibly showcased a deft arrangement of multi-storied terraces, with their networks being supported by columns made of specially baked bricks (composed of a mixture of clay and straws) that were (possibly) used due to lack of stones in Mesopotamia. The Babylonian engineers then would have filled up these columns, secured by bitumen mortar, in the dirt for the growth of the assortment of trees and plants. To that end, many scholars have pointed out how such an engineering feat would have required an entire system of pumps, cisterns, and shadufs (an ancient water-lifting device operated manually) – so as to transport precious water from the river to top of the gardens. And over time, the nourishment (and growth) of these multifarious fauna specimens would have allowed them to be suspended from the variant levels, thus presenting fascinating facades of an artificial mountaintop with lush hanging greenery. Siculus also mentions the use of stone slabs as platforms that were draped in layers of reed, asphalt, and tiles. This was possibly done to negate the dampness of water affecting the bricks of the supporting columns. Now keeping these constructional conjectures aside, archaeologists have actually come across a palatial complex inside Babylon that had its fair share of vaults and wells. But the location of this seemingly monumental structure is not close to the banks of the Euphrates, which rather contradicts the descriptions of ancient Greek authors. On the other hand, researchers have also discovered ruins of 82-ft wide wall overlays by the banks of the river, which alludes to the possibility of a substantially large structure that was built during the ancient times. Unfortunately, in any case, none of these ruins directly point to the actual existence of the incredible Hanging Gardens of Babylon. 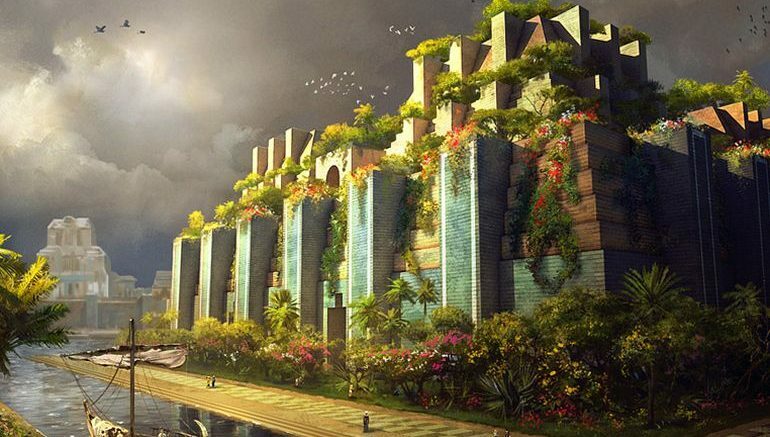 3) Were the ‘Hanging Gardens of Babylon’ even located in Babylon? In yet another twist to the tale, according to Dr. Stephanie Dalley, an honorary research fellow at Oxford University’s Oriental Institute, the Hanging Gardens of the ancient world were real. But the researcher asserts that the entire monumental scope with its enviable lushness was not even located in Babylon. Dalley made a comparative analysis of quite a few ancient cuneiform texts, and her conclusion is that the Hanging Gardens were constructed in the early 7th century BC, 300 miles north of Babylon, in the Assyrian royal city of Nineveh. Some of the translations allude to Sennacherib as the one who might have commanded the massive building project for his own palatial complex. Few texts with the Assyrian angle also mentioned the use of water-raising screws made of bronze that might have functioned in a similar manner to the renowned Archimedes Screw. As for the archaeological perspective for this hypothesis, researchers have come across ruins of an impressive aqueduct system surrounding Nineveh (near present-day Mosul) that was used for delivering water from the mountains. 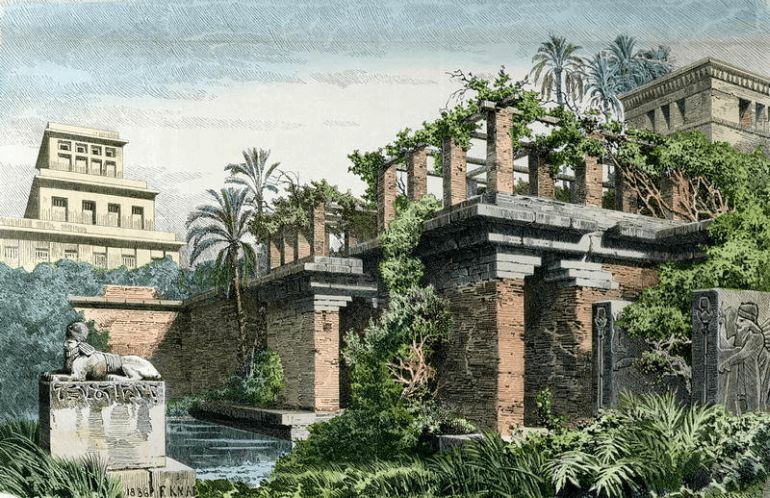 The ambit is further complemented by pictorial depictions in the bas-reliefs of Nineveh that portray a verdant garden (with arches embellished with hanging plants) being watered by this aqueduct. And beyond just inscriptions, there is practicality to consider – and to that end, the mountainous terrain surrounding Nineveh would have made it easier to transport water (by level differences) as opposed to the plains of Babylon. 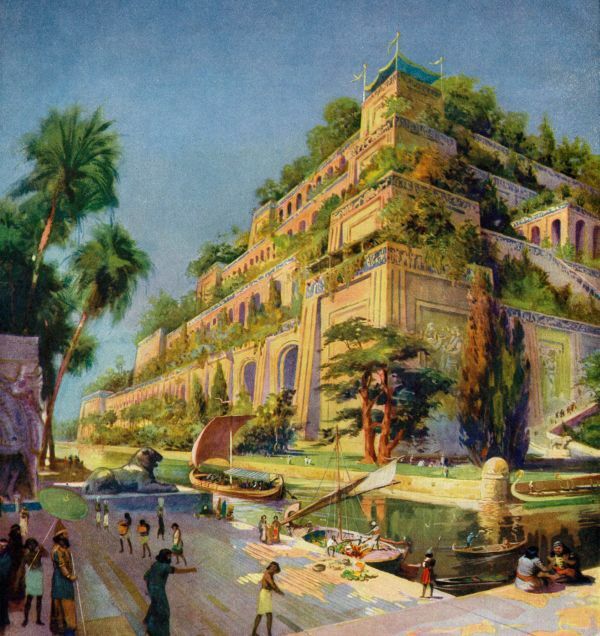 According to Dalley’s research, the ‘Hanging Gardens of Nineveh’ were probably constructed by stacking a series of terraces, like an amphitheater, that finally culminated in an artificial lake at the bottom. Satellite photos have shown the remnants of a similar structure in the proximate location which is around 300 ft wide and 60 ft deep at various sections. Now in spite of such findings, the question naturally arises – how did so many ancient authors confuse Nineveh with Babylon? In that regard, Dalley mentions how after conquering Babylon in 689 BC, the Assyrians named their own royal city of Nineveh as ‘New Babylon’. This could have created an etymological error in translation since the first account of the Hanging Gardens was only documented after two centuries of its presumed construction. 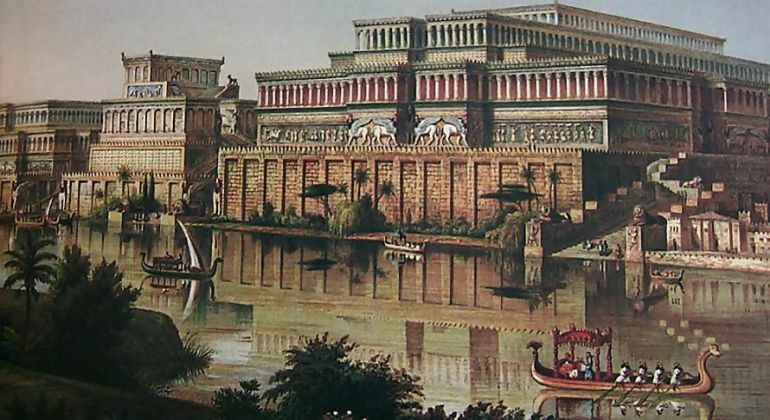 For brilliantly animated reconstructions of the ancient city of Babylon, you can take a gander at this post.